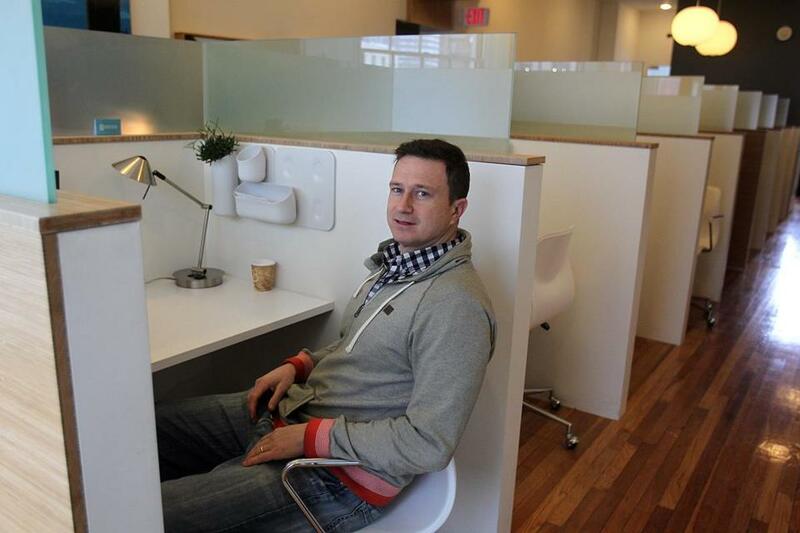 Jon Olinto, cofounder of b.good restaurants, uses shared space at Oficio on Newbury Street in Boston. The office at 129 Newbury St. looks like your typical high-end boutique workspace: wooden floors, rows of white desks divided by panes of frosted glass, pizza boxes littering the kitchen counter. But the people who occupy the desks are not co-workers: They are accountants, lawyers, a private-jet seller, software engineers, and the founders of a traveling pedicure company. Jon Olinto, cofounder of the restaurant chain b.good, is among them. Like a growing number of businesses, b.good does not have a permanent executive office. Instead, Olinto and b.good cofounder Anthony Ackil, his childhood best friend, hold job interviews and meetings in conference rooms at Oficio, which runs two shared office spaces on Newbury Street. Olinto, who previously ran the company out of coffee shops, a rented space, and a “gritty” office at the b.good commissary in Malden, can’t get much work done at home. “I have three little kids so I definitely never work at home until they go to bed,” he said. About 350 entrepreneurs and companies rent space at Oficio, paying anywhere from $69 a month to use the mailing address to $2,300 a month for a dedicated office for a team of eight workers, with 24/7 access. Oficio provides lunch about once a week, hosts networking events, and schedules guest speakers, such as accountants, to talk about the basics of running a business. Demand for shared office space is growing. When architect Nima Yadollahpour and cofounder Charlie Weisman, who runs a filmmaking competition, opened their first Oficio location at 30 Newbury St. in 2011, there were only a handful of similar co-working spaces in Boston, Yadollahpour said. Now there are dozens. Olinto and Ackil spend much of their time in their 19 East Coast restaurants and in their commissary, which serves as their distribution center and test kitchen. They have never had a fixed office in Boston in their 11 years in business — despite the $1.2 million in revenue each of their restaurants brings in annually. “We’ve always kept our business lean,” he said. The b.good cofounders are considering opening a permanent office, but in the meantime, they spend just $300 a month for access to Oficio’s Newbury Street locations — minus a price break for bringing in burgers and kale-and-quinoa bowls from b.good. Got a cool workspace or know of one? Tell us at yourstoryhere@globe.com.